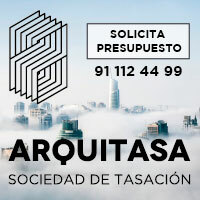 The project is addressed not only to meet the conditions of use (evacuation in the event of a fire) but also to pay special attention to its materiality and design in order to establish a dialogue with the existing building. It is intended to generate a symbiotic architectural relationship. The objective is to intervene in a contemporary way, enhancing the presence of historical heritage. The building presents a massive construction that belongs to its historical moment. Facades of brick factory and masonry boxes make up structural walls of 60cms wide that constitute, in addition to their supporting work, the image and presence of the building. Through the different bricks, the structural and aesthetic encounters of the building are detailed. It is a construction with evident character of permanence in the place. The project poses a direct, but humble, confrontation with the building. 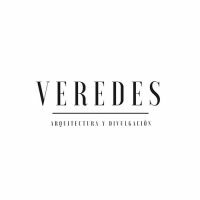 In this sense we propose an intervention of opposites in order to enhance the pre-orders: against the volumetric definition of the school, the transparency of the staircase; in front of the heaviness of the brick, the lightness of the steel. Like the existing building, the staircase uses a single material to generate not only the structure but also the image and texture, producing a brick-steel dialogue; past present. 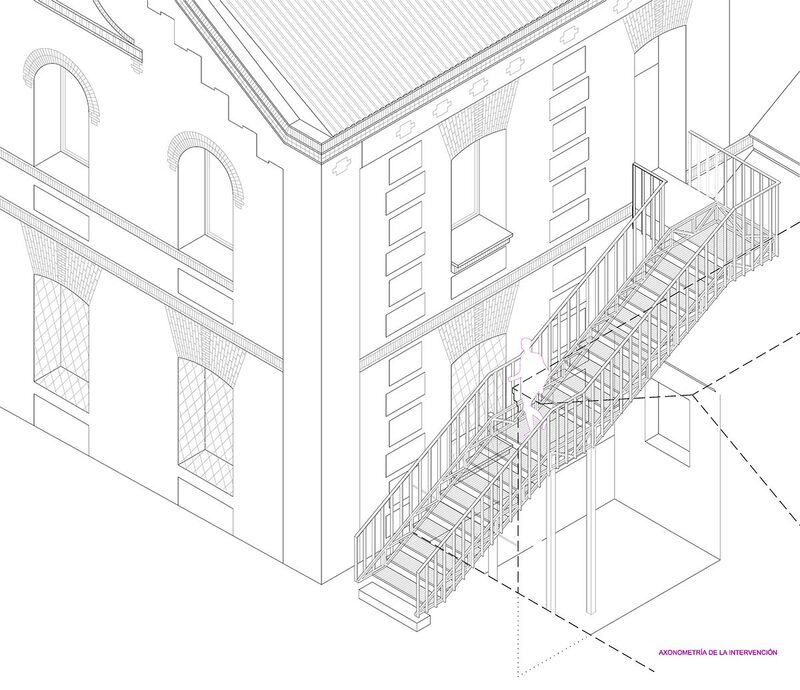 The structure of the staircase is independent of the school, reducing to a minimum the intervention both on the building and on the place, being able to be reversible or adaptable over time. To do this, two side trusses are proposed that provide the greatest possible transparency and lightness. These two trusses rest on four pillars in the intermediate landing, being flown on both sides. 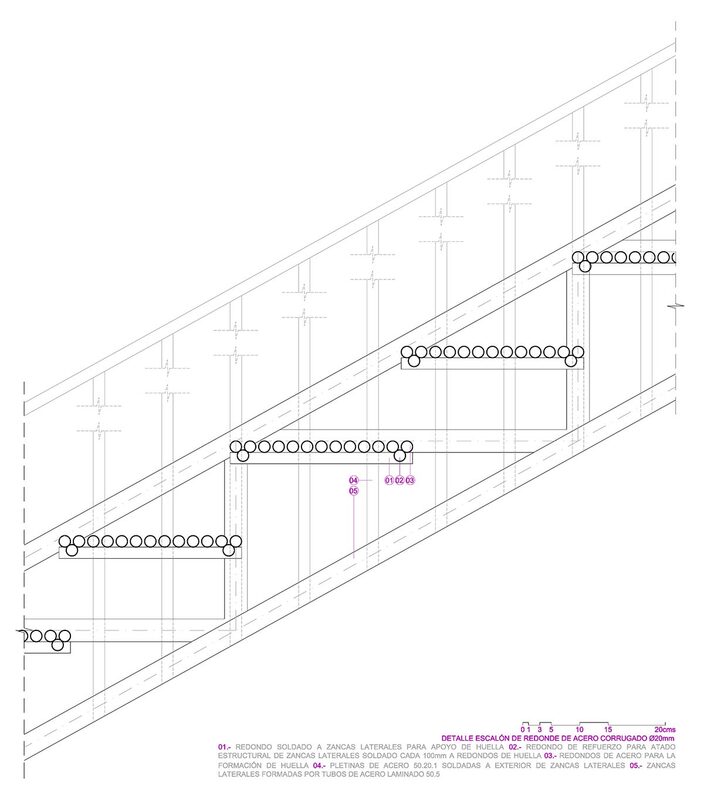 On the other hand, the tracks are made with steel rounds forming not only the footprint of the ladder but also the structural connection and the binding of both lateral stringers. 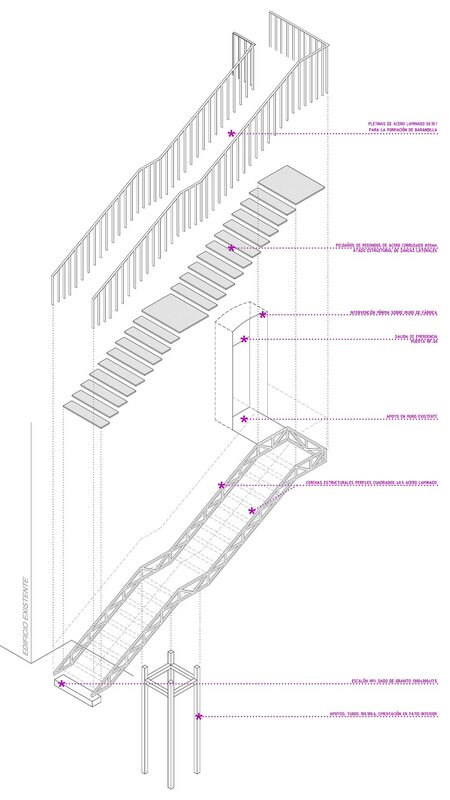 In the upper part, a support solution is proposed that only enters when the ladder is being used. While, in its encounter with the ground, the flight allows to levitate on the pavement, generating an ethereal image reinforced by the presence of a first step of granite. 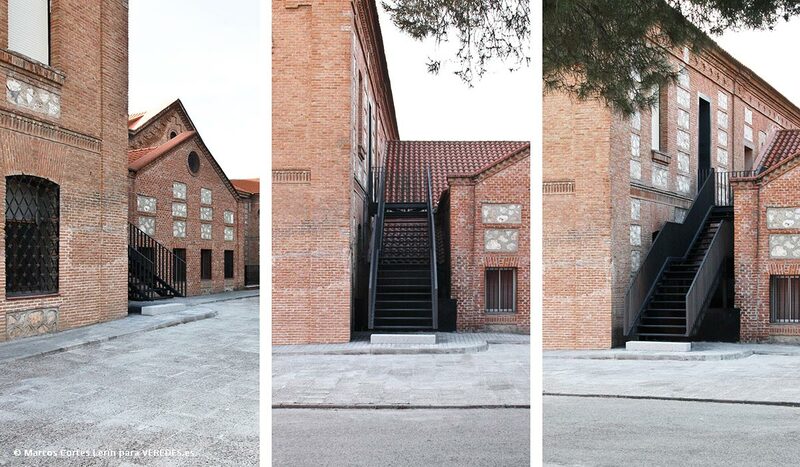 The staircase seems to float in front of the building, underlining the reversible condition of the performance while at the same time giving prominence to the school. In terms of its materiality, the dialogue between opposites is reinforced. 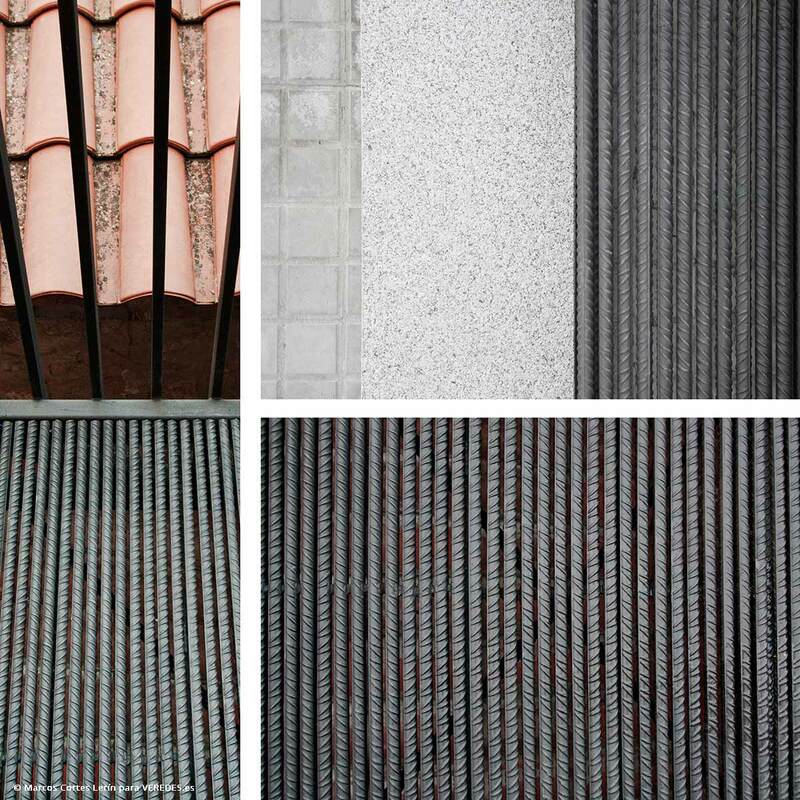 Light steel is used in the same way that heavy brick was used in the existing building: the whole intervention is, at the same time, structure, texture and image. The objective is to differentiate but integrate the ladder into the whole. 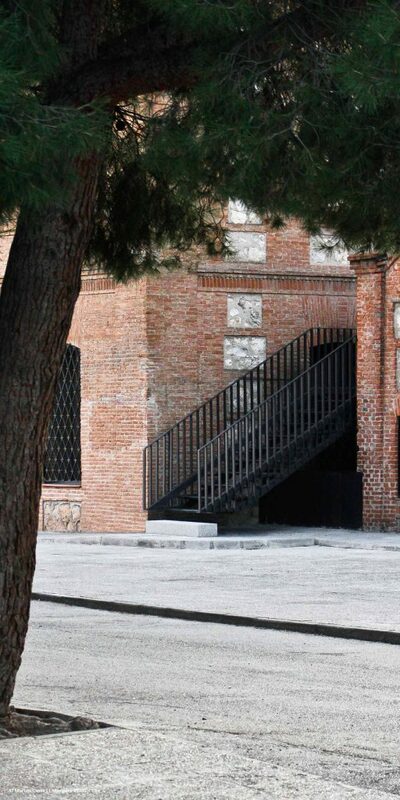 Therefore, the entire staircase is painted black, which is neutral compared to the old ocher of the brick factory. The position, one next to the other, is sufficient to differentiate the intervention, being integrated as an architectural element more in full coexistence with the historical set. 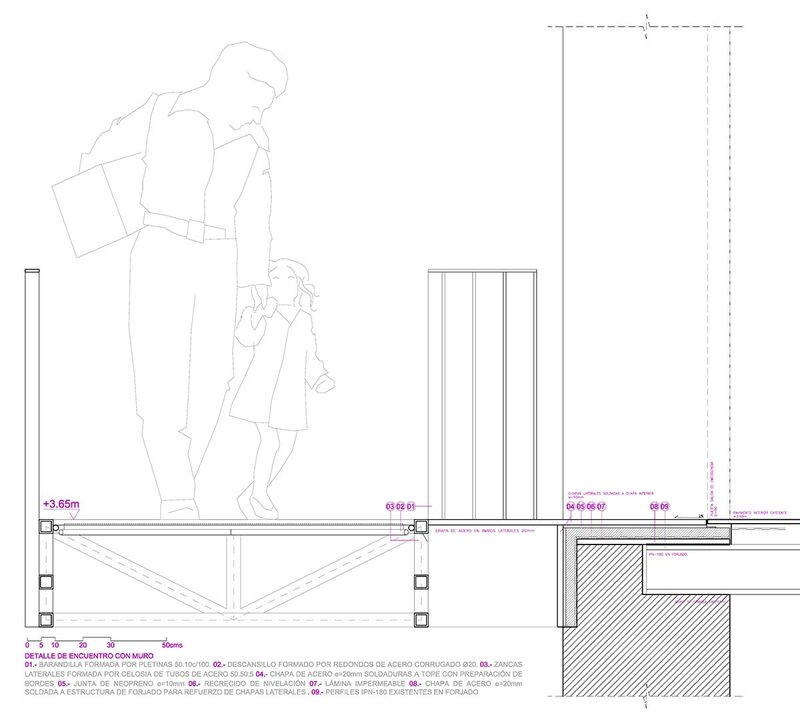 – Work cataloged in the Prizes Arquia Próxima 2016-2017.